The G&G PM5 was good, but now that it’s officially licensed by H&K it’s even better! HKS, also known as Hong Kong Style, shows us his Magpul Dynamics skills with the FMG4A3. He’s seen all of the ‘Art of the tactical ___’ DVDs at least 1000 times. 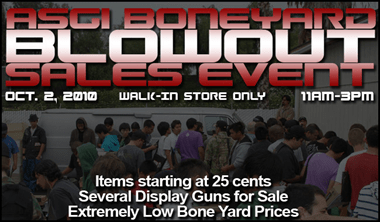 There are only a few days left until the Airsoft GI Boneyard Blowout, you will save more at this boneyard sale than you ever have at any other boneyard sale.